This discussion is part of a series of interviews conducted for Arup’s Drivers of Change programme. See Drivers of Change for more information. I met Tristram Carfrae at Arup’s Sydney office, which sits in a couple of storeys of a fairly anonymous block on Kent Street. The anonymity is typical for Sydney’s ultra-business-like CBD, but so is the casually wonderful aspect – in this case, overlooking the vast Barangaroo development site on the side of the city’s CBD, and the splintered skein of deep harbour out towards Balmain, criss-crossed with ferries and functioning as the occasional water-berth of the ocean liners, great white slabs of floating architecture that add a temporary residential function to the port, before moving on east to Hawaii or north to Hong Kong. We sit in the reception and talk for a couple of hours, over a few plastic cups of instant coffee, and just behind a model of the National Aquatic Centre, the building designed by Arup, led by Carfrae, and Australian architects PTW with Chinese partners CCDI, and that opened in Beijing just over a month ago. Known colloquially as the ‘Water Cube’, it’s being seen as a new masterpiece of structural engineering, already enjoying a flurry of publicity that will only increase in fervour when the Games start this winter. But Carfrae's career extends well beyond the Cube, and he's generally thought to be one of the leading structural engineers of his time. We talked about the Cube, and the changing practice of structural engineering that informs such projects, and how this is radically changing architecture, building and cities. We chewed over multidisciplinary working and design processes in general, as well as techniques new and old. I’ve organised this piece into loose themes, as the conversation jumped around a little. In rides Building Design magazine on a white horse, and they launch a campaign to instead have the building renovated and cared for, for perhaps the first time in its existence. 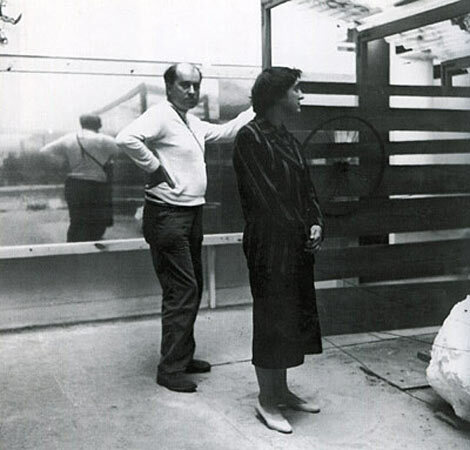 I left London before I got to experience Robin Hood Gardens in the flesh, but work of The Smithsons is fascinating, for both their thinking and practice (such as the Economist building in central London, which I have experienced), as well as their ongoing influence. Along with Cedric Price, Reyner Banham, Archigram and a few others, they provide a historical framework for much of the technologically-enabled and culturally-informed best practice of today. Robin Hood Gardens (RHG), in an area of East London so historically rich you can almost hear the psychogeographers whispering, is essentially a concrete megastructure housing project that’s been in need of such attention for most of its life. Carelessly built and serviced, the design never stood a chance. Long before the GLC disappeared, TLC for buildings like RHG had disappeared. Recently, a handful of property developers have discerned the public appreciation of brutalism moving in the right direction, but at glacial speed. Here, demolition plans appear to be moving a little too quickly, nosing well ahead of public opinion and this critical rearguard. But Building Design is quite right to point out the importance of the building in terms of design history, and also its latent opportunities for re-development (and the problematic process going on around the building). There’s nothing inherently flawed in such structures—and of course Hodge’s line about concrete is extremely revealing, as is the subtle giveaway of a very British insecurity over ‘expertise’. 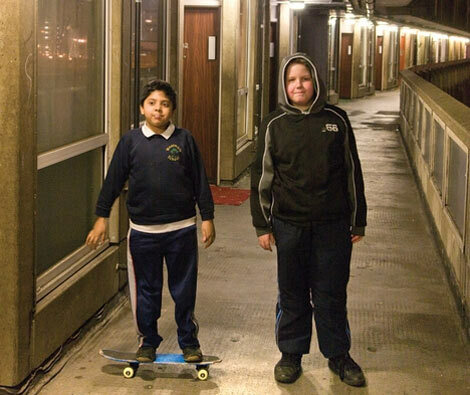 With some of that expertise, allied to willpower and a smarter framework that sees the development as an ongoing bit of work, Robin Hood Gardens can be turned around, and should provide a counterpoint to some of the lazier development blighting that part of London. RHG needs a lot of work but it is an eminently saveable building. Building Design’s campaign has already drawn in an extraordinary list of support, almost a who’s who of contemporary architecture and urbanism. While their simple comments-based petition system is not exactly watertight, it appears to be hugely successful in terms of garnering a groundswell of opinion. Sensing they’re onto a winner in terms of their relevance and influence, and maybe saving the building while they’re at it, Building Design is ramping up their activity, publishing article after article. It’s great to see an architectural magazine trying to make a difference in such concrete (ahem) fashion. Given the issues with existing built fabric in our cities—far more problematic in terms of sustainability than new building stock—you almost wonder whether campaigns such as these are the contemporary equivalent of Arts & Architecture’s pioneering Case Study Home program of an earlier age. I wonder what The Sesquipedalist will make of it? 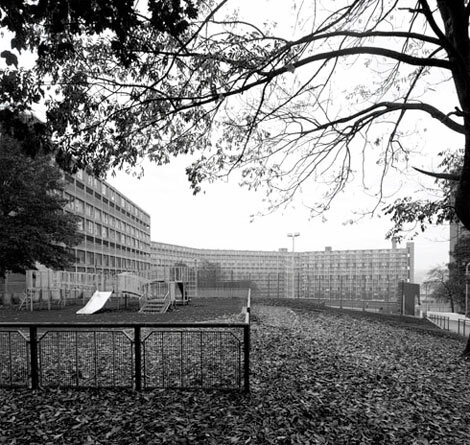 The Park Hill flats in Sheffield indicate a partial precedent for Robin Hood Gardens. Also inspired by similar precedents, they were built in 1961 from designs by Jack Lynn and Ivor Smith, on the site of tenements so rough they were known as ‘Little Chicago’ in the 1930s. Unfortunately, that malaise didn’t seep clear of the ground with the destruction of the tenements, and seems to have carried over into the new development. And particularly when the British lack of facility with delivering modernism—save a few shining examples—led inexorably to poor implementation, careless use of materials, and little ongoing servicing. And thus, the flats quickly gained an unsavoury reputation. I visited once, going to see my first girlfriend’s grandmother, high up in one of the blocks. I don’t remember much detail, but I do remember how distinctly different it felt to the suburban late-1890s semi I was living in over the other side of the city. Not better or worse, just different way of housing, subtly reinforcing the importance of these developments in Victorian cities. 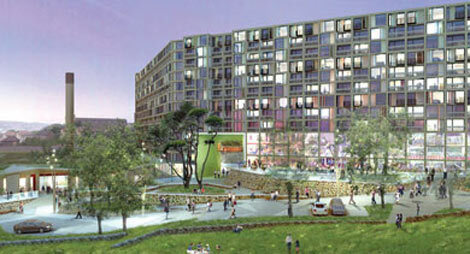 Now, the Park Hill flats are being ‘re-made in Sheffield’ (clever, that) by developers Urban Splash. Europe’s largest listed building—which is an odd honour really—will be re-vamped to provide nearly 1000 apartments close to the city centre, with a third affordable and two-thirds, well, un-affordable presumably. (It’s the presence of the latter that will shift public opinion round on the matter, you watch.) Lee Garland’s photography, if a little sombre, indicates the muscular presence of the building—even more so when you see it in situ, banked back on the hill overlooking the central train station and city centre. It’s a powerful building, and with the care and attention that Urban Splash could lavish on it, it’s easy to imagine the building transformed. Elsewhere in Britain, the Brunswick Centre in London, covered here before, may need more careful curation in its choice of retail and services, and a little more openness, but is full of life for the first time in years and seems to be working. 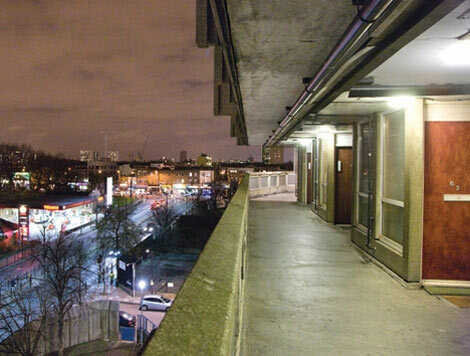 Erno Goldfinger’s Trellick Tower has also gone from “eyesore” to “desirable” in the last decade. The Barbican and South Bank still feature in those ugly contests, but are increasingly being recognised as the gems they are. Park Hill benefits from proximity to its city centre, a short walk away. As with the Brunswick, Barbican, Trellick and many others, being surrounded by good urban fabric helps. It’s a simple note, but absolutely key, and remains a problem in the case of Robin Hood Gardens. The surrounding context also needs to be addressed for the building to work—social, informational and physical—for this kind of high density living can easily reinforce an urban core, and is less well suited to the being sited on a periphery. East London has enough presence for it to work, and RHG is connected to the centre(s) of London fairly well but it will need careful local orchestration nonetheless. Yet it can still work there. 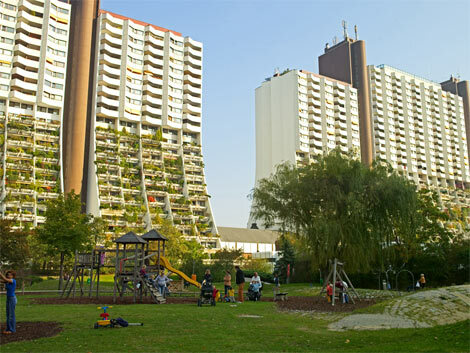 Wöhnpark Alt-Erlaa is situated outside the centre of Vienna, but with enough inherent density to anchor itself. That’s the promise of the megastructure. It’s on a different, more ambitious scale—it contains no fewer than 5 schulen, 4160 balkone and 7 schwimmbäder, most on the dach—and that, plus the integrated U-bahn, would make all the difference. It does, of course, appear to be extremely well-built, benefiting from the Mittel-European comfort with aligning modernism and craft that was all but alien to Britain. Most of all, it will be well-run too, with a mix of residents (it's not strictly social housing). Again, the ongoing servicing and maintenance of these buildings—of both built and social fabric—will make the difference. 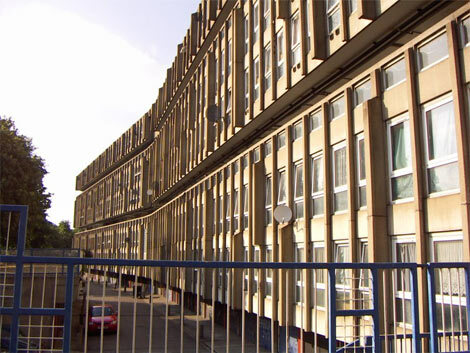 Back to RHG, and Stephen Bayley weighed in too, noting that “Robin Hood Gardens has been a social calamity” and reiterating that the Smithsons’ building was indeed flawed, but those flaws were embedded by the builders. Personally, I suspect the tenants were let down by the implementation of the building, and lack of ongoing service—as well as the post-industrial context Powers refers to—rather than any inherent piggery. Leaving aside her value judgement on modernism—which speaks volumes—and the cultural relativism elsewhere in the article that underpins her notion that modern architecture shouldn’t be judged in the same way that 'historical' structures are, it’s this ‘digital image’ comment I find fascinating. So leaving aside Hodge’s peculiar notion that most of Britain’s heritage could instead be experienced as some kind of Second Life island, perhaps like Orange County’s ‘Wee Britain’ or ‘Thames Town’ in Shanghai, one also wonders whether she had lunch with someone from Autodesk that week. You might expect City of Sound to be the kind of place that extolled the virtues of digital modelling, and indeed building information modeling (BIM) and computer-aided design (CAD) are revolutionising the practice of building, this before their benefits are yet to be fully realised. Increasingly tidying up the more inefficient and unsustainable practices of construction, once BIM truly extends into four dimensions, generating and broadcasting data about the ongoing use, servicing and adaptation of a building (incl. delivering the instructions for its ultimate de-construction and recycling) a more sustainable form of construction can be realised. And once the building becomes a platform for other communication, from personal to civic, and if that scales up to a neighbourhood and city level, then we’re really going places. But I don’t think Hodge is talking about that. I think she imagines some kind of 3D fly-through. Perhaps wearing goggles. But she, and we, should be clear about the limits of models too. In no way do they—and we can even say, will they—approach the experience of a building. Simple as that. A cursory reading of Pallasmaa will make that clear. Few models can deal with the peripheral, never mind the multi-sensory experience of being there, and never mind the multi-layered historical weight of a place or space. Digging further into her Merleau-Ponty isn’t something I imagine Hodge does of an evening, any more than I do, but if she were to, she might reconsider her strategy of replacing buildings with “digital records”. Entrusting those digital records to her particular administration would be like giving it to the informational equivalent of the Deen Brothers anyway. Experiencing a building in the flesh is so different to constructing and studying a digital model, that it’s frightening that Hodge —a culture minister—could even think to suggest it. I recall walking into a small, very old cathedral in Milanese side-street, I think, lured by the sound of the choir, and once inside I hear their voices conjoin with the wails of black-clad kneeling women, rocking backwards and forwards near the altar, and sensing the sheer physical presence of that sculpted block of sound hanging in the rafters of the immense vaulted roof over my head, light puncturing the gloom through stained-glass windows and illuminating the sparkling motes of cool dust floating around me, some microscopic elements falling on to my tongue and fusing taste and smell with those being inhaled in my nostrils, the interior rushing away from my body as I begin to stand upright and breathe it all in, having ducked through the small threshold into its cavernous innards, my eyes adjusting to the gloom and slowly revealing the detail in the polished wooden pews that a million hands before mine had touched. All that, and more that I don’t have the words to describe, in a transition from outside to in, over a few seconds … And equivalent sensations might be enjoyed in a grain elevator, a converted power station, a public administration building, a swimming pool, a side street of SoHo at midnight, a small house in Tokyo in the early morning, a square in Melbourne at midday, a summer house in Finland at dusk, or in practically any kind of building. You will have your own examples. Well, I’m sure a digital model will exist for that church in Milan, but I’m not sure I’ll get that same sensation when I click on it. 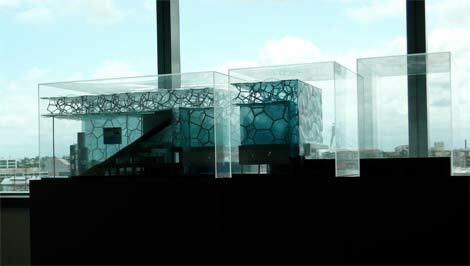 Let’s quickly put to bed this idea of digital models replacing a building. They can augment a building, and are certainly invaluable in design processes, ongoing running of buildings, education, heritage and a thousand other worthwhile pursuits. But they are not simulacra, for buildings exist. Well done to Building Design for bringing this sorry bit of politics to the foreground of at least the architectural press, and good luck to them with their campaign. As a fan of the Smithsons’ thinking, and of several of their buildings, I'd like to see this pioneering architecture cared for. Park Hill, Brunswick, Trellick, South Bank, and Barbican all show that British modernist buildings that were once though beyond salvation can be turned around. Other high-density housing megastructures elsewhere indicate they can be done well in the first place, if carefully constructed and serviced. Concrete is one of the most useful, pleasing and thrilling of materials. Digital models have immense value, but not as replacements for buildings.